Edgar P. Harney Spirit of Excellence Academy, one of four New Orleans schools facing closure. As state-issued school ratings loom, parents at several New Orleans schools await final word on whether the district will close their children’s schools. 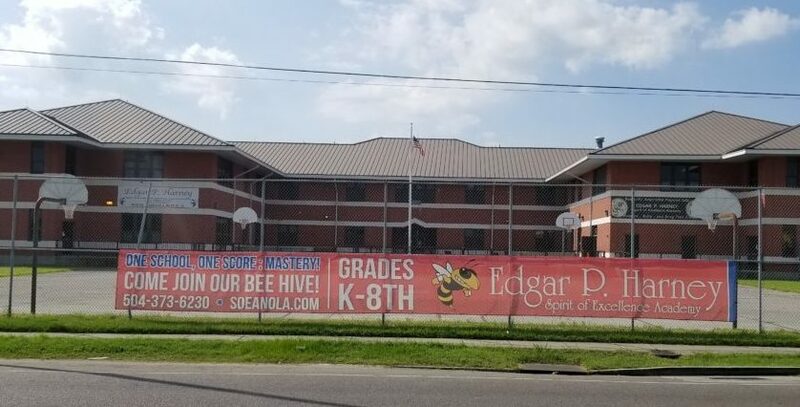 Fifteen schools are up for charter contract renewals or extensions, but the Orleans Parish school district has strongly hinted that four are in danger of closing. And the only elementary school in the city that’s not run by a private charter school group could be merging with one. At Edgar P. Harney Spirit of Excellence Academy, parents will meet with district administrators Monday night amid administrative turmoil. Last week, the embattled board suspended its principal. Earlier in the week, the principal, Ashonta Wyatt told The Lens that she was worried the board would fire her. The school, which has a C rating from the state, is in danger of closing because it has racked up warnings from the school district over its financial practices and what the district said is a failure to provide adequate special education services. Harney parent Lateisha Vallery-Broden said she has faith in the teachers and hopes the school will remain open. “As a parent, I need to know if my daughter’s school is closing,” she said. Cypress Academy, in Mid-City, is the last remaining district-run elementary school in a system now made up almost entirely of privately managed charter schools. Just six months after the school district promised to run Cypress through the end of the 2019-2020 school year, some parents there are worried that officials are already looking to outsource it to a charter group. The district took the school under its wing last spring after its charter board abruptly decided to close. Cypress parent Madelyn Meyn told The Lens she wants the district to uphold its two-year commitment. The district has introduced Cypress parents to four charter groups, but she doesn’t think any are viable options for a merger next school year. She’s worried that won’t stop them. Some parents think the district intends to announce a new charter operator for Cypress before opening the citywide enrollment lottery, called OneApp. The district has delayed OneApp until after the release of district Superintendent Henderson Lewis’ charter school renewal recommendations, when parents will find out if Lewis wants to close their children’s schools or keep them open. The recommendations are scheduled to be released next week. OneApp will open Nov. 19, about two weeks later than previous years. Independent charter schools are publicly funded but privately run. Though the elected Orleans Parish School Board has ultimate authority over the schools, day-to-day operations are overseen by nonprofit boards at each school. In exchange for the freedom to hire their own staff and select their own curriculum, charters must meet annual academic and financial benchmarks. That makes state letter grades — annual evaluations of each school based mostly on state standardized test results — particularly important for schools in the last year of their multiyear contracts. The state Department of Education will release school grades on Thursday. The superintendent’s charter renewal recommendations, largely based on those ratings, will likely be released Monday, Nov. 12. The Orleans Parish School Board will hear them during its meeting next week. Vallery-Broden, whose daughter attends Harney, said at a meeting last week that problems seem to lie with the Central City charter school’s governing board. She knows the school has gotten in trouble for financial mismanagement. That’s been a concern at Harney since it was part of the state-run Recovery School District. It transferred to the Orleans Parish school district in 2017. All remaining RSD schools transferred back to local control this summer, and the Orleans district is running the majority of schools for the first time since Hurricane Katrina. Members of Harney’s nonprofit governing board “are not holding up their end of the bargain,” Vallery-Broden said. Harney is one of four schools where the district halted enrollment. But parents at Harney don’t understand why charter-board mismanagement would cause a C-rated school to close. The three other schools all have F ratings, meaning the state considers them to be failing. Medard Nelson Elementary School, run by the New Beginnings Schools Foundation, and William Fischer Accelerated Academy and McDonogh 32 Charter School, run by the Algiers Charter network, all must receive C’s to remain open. Fischer and McDonogh 32 have combined campuses for the remainder of the school year as they face low enrollment. All three schools have had F’s for at least two years running. The district has given Cypress parents two options to remain open after the 2019-2020 school year. Find a charter operator to merge with or start a charter themselves. The district has introduced four different charter schools to Cypress parents over the last two months. Some parents feel they need more time to explore the four potential charter operators. “I am confused as to why this decision is being rushed since OPSB agreed to operate Cypress for at least two years, and can only come to the sad conclusion that OPSB wants to quickly merge Cypress so that they will not have to operate us next year and therefore will not have have the fiscal responsibility of Cypress,” parent Stacey Seefeldt wrote in an email to district leaders. “I ask that you give us more time to reach a majority vote as a school community,” she wrote in closing, attaching a photo of her son. In his press release Monday, Lewis acknowledged the importance of his upcoming decisions. “November is a pivotal month for our still very new, unified school district,” he wrote.